– Laos (at 7:00): Sleeper bus, visa on arrival. (If you would like to go at another time, out of the timetable above, please contact us and we will help you. Please note that prices quoted are subject to change. Price changes, lower or higher, may occur by reason of matters outside our control. Such factors include adverse currency fluctuations, fuel surcharges, holidays. Please contact our office for up-to-date prices). 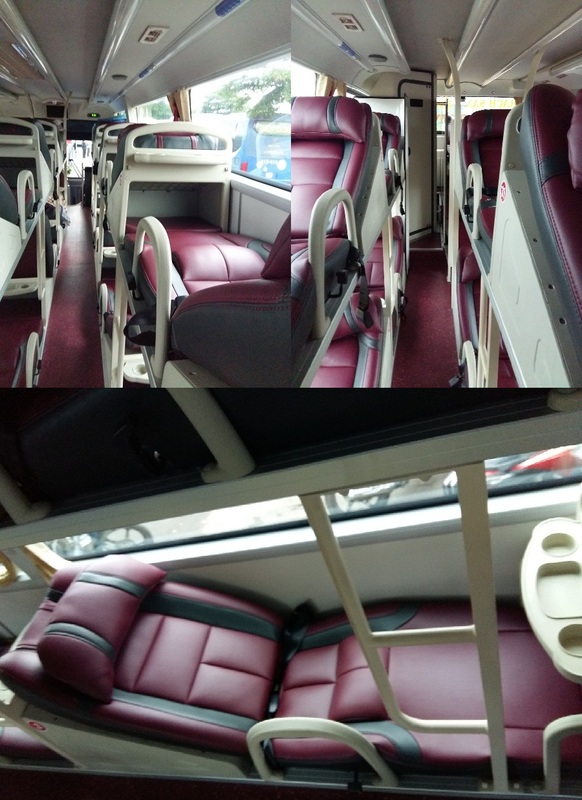 * Clean buses, soft sleeper, toilet, free wifi, air-conditioned, non-smoking, best price. How to BUY/BOOK bus ticket from Da Nang? You may buy tickets at the Da Nang Intercity Bus Station, travel agencies, and possibly your hotel. Buying tickets at the station is the complicated option (taxi fare from city center to the bus station more than 100.000 vnd/1 way, and you have to come there to buy the tickets in advance to make sure they still have available tickets; otherwise, you have to come back again and waste much time and money), so paying a premium at your hotel or come directly to our office (or just send us an email for ONLINE TICKETS BOOKING:Dnbackpackers@gmail.com) is the best choice that you can save much time, money and worry, you don’t have to pay online for booking (unsecured), we’ll pick you up at your hotel. You can buy the one-way ticket, return ticket or open ticket, you should call or email us to book at least one day in advance to be sure that we still have available tickets, free-deliver tickets to you at your place or you can come to our office directly. Very cheap pick-up services are available. Best service guaranteed, please don’t hesitate to contact us (24/7) if you need any help along your journey. YOU CAN BOOK/BUY IN ADVANCE WITHOUT BOOKING FEE !